Amir Khan still has his sights on a fight with Floyd Mayweather despite only being on the undercard for the American's title bout on Saturday. Khan, 27, knows all eyes will be on Mayweather's WBC and WBA unification fight with Marcos Maidana at the MGM Grand in Las Vegas. But his earlier fight with Luis Collazo could be an audition for a lucrative shot at Mayweather in September. "We want to steal the show and have fans talking about our fight," he said. 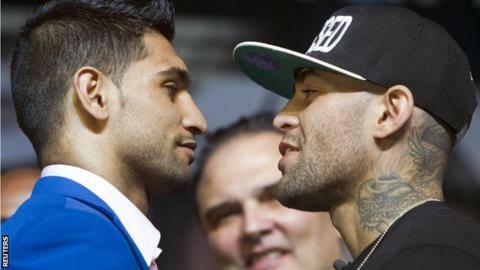 With 19 knockouts from 28 wins and three defeats, Khan was in contention to fight Mayweather on Saturday but the American opted to take on Maidana despite Khan topping an online poll to choose the opponent. He was philosophical about not getting the Mayweather fight this time around, saying it gives him more time to work with new trainer Virgil Hunter while also adapting to a new weight class. Khan, from Bolton, moves up from light welterweight to welterweight to fight former champion Collazo, 33, in a bout that will do more than just test his ability at the higher weight. "I would have loved to fight Mayweather, but I believe it's really for the best,'' Khan said. "It gives me a chance to get to 147 (pounds) and feel my way." Khan, a silver medalist in the 2004 Olympics, fights for the first time in more than a year after struggling in his last outing, last April, to beat Julio Diaz in Sheffield. "People always remember you from your last fight, and my last fight wasn't my best," Khan added. "People are saying I'm looking past Luis Collazo for Floyd Mayweather," Khan said. "If I lose this fight, there is no fight with Floyd." Collazo is not the kind of fighter anyone can overlook. With 18 knockouts from 35 wins and five defeats, he is a former two-time champion coming off an impressive victory over Victor Ortiz inside the distance.